BFC, Ink. Kaitlin wanted to be a princess so I made her this dress using the Royal Birthstones set. Since she is taller and wider than Barbie I used more pieces for her outfit. I used two tops, one for the front and another for the back, see the Ellowyne Wilde post for more details on this. Basically I fitted the front top, removed it, then placed a top on the back and wrapped it around to the front, placed the front top in place in the front and taped the two tops together with the front top overlapping the back top. I then made the sleeves by cutting a straight skirt in half and wrapping the halves around the dolls arms for sleeves and taping the overlapping edges. I prepared a small circle, cut it in half, and wrapped the halves around the top of the sleeve, overlapping and taping the edges in place on the straight sleeve. I made the skirt similar to the one I use for the American Girl Dolls by taking a front flared skirt piece and two back flared skirt piece and taping them together with one back piece on each side of the front piece. Then wrap the skirt around the doll and tape the overlapping edges in the back. I taped the middle of the skirt in place on the middle front of the doll because there was a specific design element I wanted to match up. Lastly I added a belt. The skirt on this dress is not floor length but more mid calf. However, it is still cute and Kaitlin is enjoying being a princess. 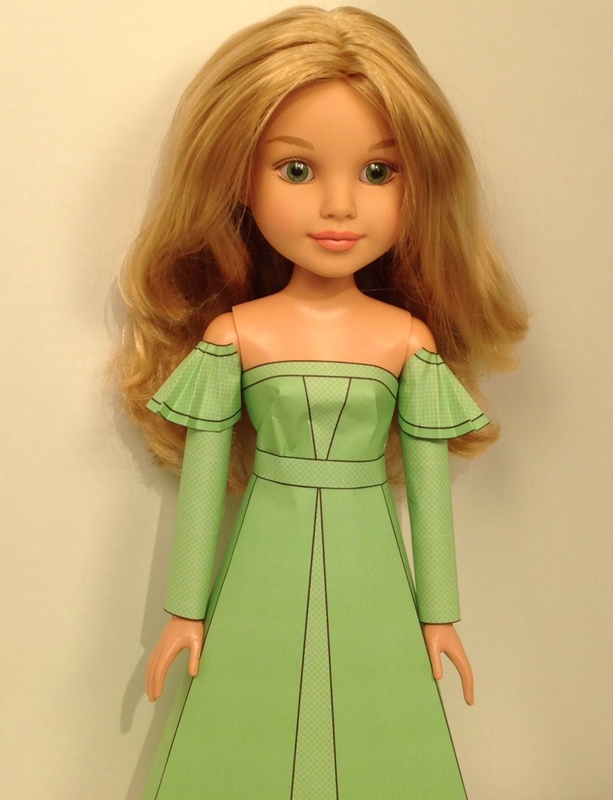 For a more modern look, the straight skirt, using two pieces, a front and back, could also work for BFC Ink dolls and there are several sleeve variations that would work for her too.